I et land med 650 representanter i parlamentet må det nødvendigvis av og til bli ekstraordinære lokalvalg (såkalte by-elections). Dette kan ha flere årsaker som dødsfall, oppsigelse, kriminalitet, konkurs eller jobbskifte. By-elections måler ofte temperaturen på den politiske situasjonen, i tillegg til de sedvanlige meningsmålingene, og blir fulgt med argusøyne av partiene. It is famously a law of the political realm that by-elections do not matter – except, of course, when they do. Such contests are forced by unexpected departures (David Miliband from South Shields, Louise Mensch from Corby); the criminal descent of an MP to HMP (Chris Huhne vacating Eastleigh, Denis MacShane stepping down in Rotherham); and death itself, which last month deprived Wythenshawe and Sale East of Paul Goggins, the constituency’s popular, long-serving Labour MP. I de siste fire by-elections har Ukip tatt annenplassen. I Wythenshawe igår ble de igjen nummer to (18% – de fikk kun 3,45% i 2010), etter Labour som fikk hele 55% av stemmene. De konservative havnet på tredjeplass med 14%. Det var kun 28% som stemte ved dette valget, sannsynligvis på grunn av uværet som herjer landet for tiden. Liberaldemokratene tapte hele 17 prosentpoeng og fikk under 5% av stemmene. Speaking on ITV, Cameron said: «Well obviously, the Wythenshawe byelection, which is a very safe Labour seat, there was never much doubt about the result. When people know there’s a byelection, they know the government isn’t going to change, that obviously messages and signals are sent and protests are made and government should always listen to those things and I always do. Nigel Farage var «very pleased» men kritiserte måten ekstraordinære lokalvalg blir organisert på. 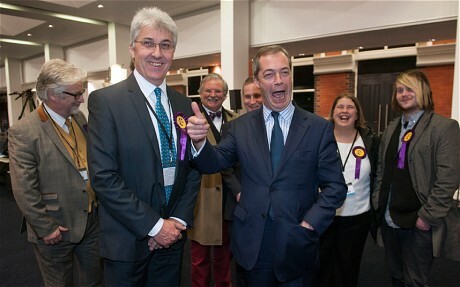 Mr Farage, speaking from the count at Manchester Central convention centre, said he was pleased with how his party performed but complained forcefully about the way the election was run, with postal votes issued just three days after the poll was called. «The point about democracy is you should see who the candidates are, see what their agendas are and then form an opinion,» he said. «That is not happening and it is reducing, frankly, these by-elections to farces. Det britiske valgsystemet er «winner takes all». Det er ingen utjevningsmandater. Ukip må vinne lokalvalg skal de få representanter i parlamentet.